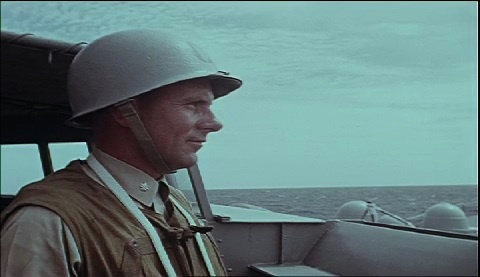 1) MCU R. C. Barnhart (C. O. of USS Turner Joy, DD-951) scanning the horizon, with a pair of binoculars; telephone talker is standing next to him, wearing phones and helmet; open sea off to right. VG2) CU C. O. of USS Turner joy, scanning the horizon, thru his field glasses, from open bridge. VG3) CU LT. J. Palmer (Operation"s officer) looking thru sighting area on pelorus, giving bearings; Lieutenant. Palmer is wearing helment.4) LA CU Signalman sending message by signal light, from USS Turner Joy. VG5) MS Signalman sending up a hoist, from flagbag. G6) CU Lookout scanning the horizon, with his binoculars, sending a report over phones, as he points with his right hand, after putting down the binoculars; he again raises the binoculars, scans the horizon. G7) MCU Interior view of the space, showing men operating the tracking devices; two men are on the radar; third man is standing in BG, with phones. G8) CU Man on station, working radar tracking device. VG9) MS Flashes from gun fire on fantail of USS Turner Joy, during the night. VG10) CU C. O. of USS Turner Joy, speaking on ships intercom; C. O. is wearing a helmet, binoculars, and some sort of khaki life vest. VG11) CU Officers and men gathered around shart table in radar room, onboard USS Turner Joy, plotting a course. VG12) CU Man on radar scope; shipmate standing to his left, with phones, as is the man on radar scope. G13) CU Two officers and enlisted man on scope; small bit of a sweep is seen from distance; both officers and enlisted man are wearing phones, as markings are made on radar screen. G14) MS T. L. Billingsley (AO3) pulling a 1000 1b. bomb, from bomb elevator, on small bomb cart, after the bomb arrives at the flight deck on the elevator. G15) CU J. E. Danial unloading rockets from elevator, by a trailer, and pulling the rockets out of frame to left. G16) CU Looking down over bomb elevator; 250 1b. fragmentation bombs come up on elevator; handle is attached to small cart; three of the bombs are pulled off. G17) MS 1000 1b. bomb coming up on elevator to flight deck level; R. A. Eggan pulls the bomb from the elevator, onto flight deck. G18) MS A-1H spotted on flight deck of USS Ticonderoga (CVA-14); others seen spotted in BG; bombs are loaded on wings of the aircraft. G19) MS Ordnance-man hanging bombs on A-1H aircraft wing is a 250 1b. fragmentation bomb. G20) CU Gas crew fueling the wing pod on A-1H aircraft; hoses in FG. G21) MS Men pushing bomb carts over the flight deck, with bombs to be loaded aboard the aircraft. G22) MS Four pilots in flight gear, walking toward camera, over flight deck; island in far BG. G23) MS Two ordnance-men using the small bomb hoist, to hoist a 1000 1b. bomb under the under carriage of A-1H. VG24) LA MS LCDR. Brumbaugh boarding A-1H, climbing into cockpit. G25) LA MCU Lieutenant Commander. Brumbaugh in his cockpit; plane captain comes up onto wing, hands the pilot his hard hat helmet, assists pilot with his harness; plane captain is A. Kolesar (Adran). VG26) ECU Ordnance-man working underneath the aircraft; 1000 1b. bomb is seen hooked up under undercarriage to left. Chicago: “Vietnam: A Television History; Simulated Tonkin Gulf Incident! At Sea,” 08/14/1964, WGBH Media Library & Archives, accessed April 22, 2019, http://openvault.wgbh.org/catalog/V_854AFB697BF148508D6E7BB811128707. MLA: “Vietnam: A Television History; Simulated Tonkin Gulf Incident! At Sea.” 08/14/1964. WGBH Media Library & Archives. Web. April 22, 2019. <http://openvault.wgbh.org/catalog/V_854AFB697BF148508D6E7BB811128707>.